Egypt Freedom War | WE DON"T WANT THEM IN OUR COUNTRY : RESPECT THAT !!! After days of protesting , and moving from and too places of actions time to get some rest , well the first victory is done … Celebrations are almost over .. but still too much to do … and many ways to go ..
– Jan 25 : was the first real action for me and real protesting , i knew something was different . – i realize at Jan 28 we are at massive war and the regime will hit more and more , as Mubarak’s military training and thinking will strike in our weakness , in waves as he will never surrender quietly or run away as Ben Ali . but it was too late to give up . -Since i carried some babies whom were suffocating from gas police and secret police lunched at their home , and handle a 9 years old baby who died , i believed i will get back his revenge . – Yet at Tahrir square i knew , what is the real meaning of begin Egyptian , knew and talked with very strong people men / women , from many socioeconomic levels , but we all believed in the same values …. we always wanted the same thing , but that was our first announce and meeting ..
-So Its time for cleaning and building yes , but we don’t forget and quite surly we don’t forgive so its also time for black listing for whom stand against us of the media and press ( propaganda ) personals , whom used as weapons against us , also for who stole us of the corrupted ugly greedy businessmen , and of course for the corrupted sadistic officers either for the secret police , or the police .. 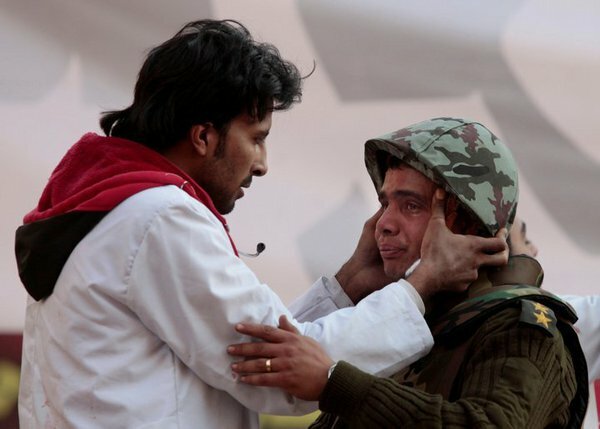 But also we don’t forget the honorable officers whom stand against orders and refused to hit us , we can’t forget whom refused orders to released the criminal and thugs from the prisons especially in my home town ” Mansoura ” and stand up to guard the prison instead of their soldiers , i am honored to know 2 of them …. It’s time for building , fixing , reconstructing but also a time for the black list .. I was just finishing my praying , trying to walk out of the crowds , as i am not used to crowds , it takes more than 20 minutes to walk through all those people to get to calm place , to get rest , eat or lay down … but as am still stuck , i herd the people chanting , and screaming ” HE IS GONE ” , “Allah Akbar” , ” We Won ” , Some starting signing , but soon as one of the old famous songs came up , we all starting repeating after it , all in one voice .. Some were crying , personally i cried too , i could not believe that yet , i tried to confirm many times though the phone but phones network were busy , but i don’t need to confirm , cause WE ALREADY are celebrating our victory . Celebration , started alone , i thought the real celebration will be out there , at the streets , especially from the people who didn’t join us at the first day , and from whom are manipulated to believe we will never win , and of course from those who started to doubt our revolution .. I went out of the crazy crowds , when i was trying to get i found myself standing face to face with mother of the one of the martyrs , she was happy singing with the crowds , her eyes were full of tears but she were singing , i could not find any words except ” Thank you mam , Thank you you are the first hero in here ” , she locked at me back and said the last thing i never expected ” NO , You could take the bullet too instead of my son , you are all heroes ” … My tears started to come out . In my way to the streets , People still gathering at ” Kasr Al-neel bridge ” , that famous bridge with lions in Cairo , PEOPLE are more there , the celebration is not just in Tahrir square its all over Egypt , young men standing on the head of the lions , the crowds are MORE massive out side , and at the bridge , cars went crazy honking their horns in celebration, people expressed their happiness with their car horns , as people were expressing their happiness using whatever they can . Crowds still massive , i need to get to the real streets …. I kept walking , to reach ” Lebanon Square ” as i decided to go to their walking , people are still coming on foot and in cars and the streets are crowded too , i walk in the middle like victorious rising my both hands as victory sign .. PEOPLE focused on me , keep saluting me . Well THIS IS the real gift ….. this is the real outcome . I kept walking , for more than an hour , people are less cars are less m but still saluting me and someone else who were going back home from Tahrir with 2 back-bags one on his chest the other on his back , with victory signs we kept walking , few minuets later i asked him ” how long ” , ” he said : 11 days , now i am going home to my mother ” , well this is the real hero , 11 days staying in Tahrir square i knew some hid , some ran away , but he lived there , i rise his hand as a boxer who just won , and tried to be get one of his bags off him to carry with him ” were too loaded and heavy ” but he refused … We walked together ….. now some people are screaming ” Those are Tahrir guys ” and keep saluting us … WELL This is was OUR REAL Celebration …. After sometime walking on the streets and after , that real hero goes home i felt tired of walking i decide to go back to my second home ” Tahrir square ” , i took the subway “ Boohoth station “, it was crowded too , people coming from and to Tahrir square , they said it’s the last ” Metro ” but it was 8;15 pm . in the subway some were crying yet , some are celebrating , waiting the last ” Metro ” to Opera station which beside ” Tahrir square ” a Metro horn’s voice is coming through the tunnel , is the driver celebrating using his Metro’s horn , Wow , the driver didn’t stop honking …. Many emails , saying ” Congratulations , for your freedom ” , most of those emails comes from Europe , USA , Asia and with particular country Turkey ..
My Friend Jason White , who was supporting us , translating , making video and podcasts , about what’s going on , called me in the subway more than n hour ago saying ” Congratulations , i am so happy for you ” chat with me , along with many other friends , especially anonymous group were so happy and excited .. My friend “ Nasser Alkhateeb “ called me from Australia to congratulate me .. well this was the best emotional call i got in this day … My father called minuets later , he was crying … he was so happy … so as my mother …. To Adem Marmekaya , Akf Emrea , Sinan Ata from Turkey , Thank you …… Alim bay from Ukraine . To my friend Bartalan Mesko “ scienceroll.com “ from Hungry , Thank you ..
Well this made me happy more than ever …. You may be wondering what’s next ? Well it’s simple , the last part of getting our freedom as i see it me and my activists friends we will prosecute them all , we will not let them get away with what they did to us , to our Egypt .. me and my friend decided to not go down or calm but we will hunt them down in court room , we will protest peacefully and never give up , will never give up hope , and hey a message for whom is coming next , WE KNOW THE WAY and we are NOT AFRAID ANYMORE ! Thank you all , my friends no my family overseas , for supporting , protesting , writing , publishing and spreading our words . Reports say that plainclothes police officers and snipers have launched a crackdown on millions of anti-government protesters in central Cairo. This comes as anti-government demonstrators are gathering in Liberation Square as protests against embattled President Hosni Mubarak continue for an eleventh consecutive day. Latest reports, however, say there are running street battles between protesters and security forces in some areas in Cairo. At least 30 protesters have been arrested, reports say. Two French journalists have been missing in Cairo for the last 24 hours and an Egyptian journalist has been killed. Millions of Egyptian protesters have vowed to stay at Cairo’s Liberation Square until Mubarak relinquishes power. They have dubbed Friday the ‘Day of Departure,’ saying the massive rallies aim to force Mubarak out. Similar demonstrations are being held in Alexandria, Suez, Aswan and Mansoura. 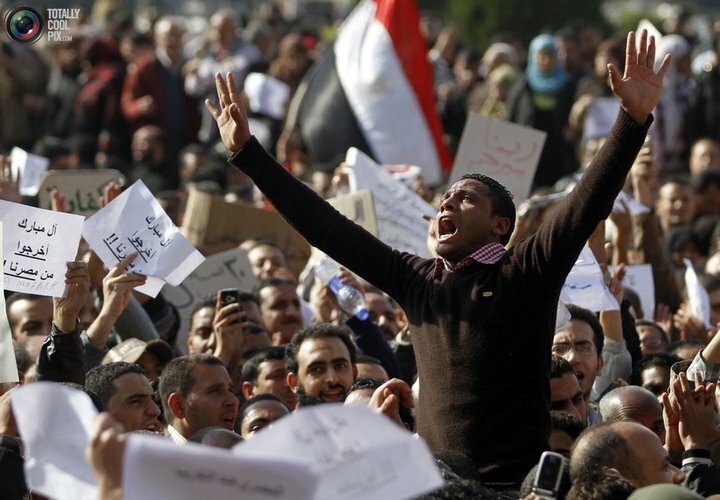 Opposition leaders have called for a week of protests against Mubarak, having named it the Week of Resolution. Arab League Chief Amr Moussa and Egypt’s Defense Minister Hussein Tantawi visited anti-government demonstrators at Liberation Square. Friday’s demonstration was largely peaceful compared to the demonstrations over the last two days. fAt the beginning, people we chanting “Selmeya, Selmeya” = ‘Peaceful, Peaceful” and “Yasqot Yasqot Hosni Mubarak” = “Down down Hosni Mubarak”… and then, this happens! Some people are calling for retreating and stopping the revolution; There is a description for them… “cowards”. If those people who flew away like bugs were your brothers and sisters, what would have been your reaction? 1) This vlog was recorded on January 18th by Asmaa Mahfouz, the girl who helped start it all. She had shared it on her Facebook, and it had gone viral. It was so powerful and so popular, that it drove Egyptians by the thousands into Tahrir Square, and drove the Egyptian government to block Facebook . I’ll shut up now and let Asma talk. 2) Most of you have seen Asmaa’s original vlog pleading with people to show up on January 25th, here’s a vlog she made a few hours before the big day. Tension in her voice, but determination and hope. 3) Asmaa Mahfouz recorded and posted this vlog on January 26th, after an eventful Tuesday on January 25th, the first day of th revolution. She describes what she saw and urges people to continue and join her after Friday prayers, on January 28th. Special Thanks to ahasanen87 for quickly translating this for us! Thug admitting police let them out and gave them weapons. Prisoner: Afterwards, they told us take these cars, and get out of here, the country is yours. Whomever you want to kill, kill. Whatever you want to do, do. That’s it. Speaker: And they gave you cars and weapons? Prisoner: Yeah. But those thugs and others who don’t care about their lives took weapons, but people like me did not take﻿ any weapons. Military officer: Why did you not take any weapons? Prisoner: No. Why would I? What do with it? Go kill my brother, someone like me? Speaker & military officer: Why were you there? Which prison were you in? Speaker: For how long have you been out? Prisoner: I ran off yesterday, and surrendered today. Speaker: So the interior were the ones who gave you weapons and cars? Speaker: And they told﻿ you to get out, destroy, break, rob, and do all you please? Prisoner: Yes. Yes. The Azbakeya & Khalifa police stations, on Friday, let out their jailed to beat up civilians. Some of those prisoners followed orders, others did not want to and just left. Prisoner: El Khalifa, Imbaba & El-Warra2 are the police stations that did that. Prisoner: El-Matareyya station, before it was put on fire,﻿ they let out prisoners. Speaker: Who let them out? Prisoner: Police. The officers. And you have the Matareyya people/prisoners here, ask them. If I am mistaken, punish me. Speaker: No I want to listen to you. So now Abu Za’bal prison (a huge prison) is empty? Speaker: And the interior are the ones who let you out? Prisoner: Yes. The only prison still under control, by the military, is El-Marg prison. Speaker: So the interior let you out for sure? And gave you weapons and cars? Prisoner: Yes. Yes. They said here are some weapons. Here are the storages. Speaker: Oh! They also told you were ammunition﻿ storages were too? Military officer: Why did they do that? Speaker: So we go out in the city, destroy and rob everything.